Miniature oil filled Coilover shock components for scale cars. A shock absorber (in reality, a shock "damper") is a mechanical or hydraulic device designed to absorb and damp shock impulses. It does this by converting the kinetic energy of the shock into another form of energy (typically heat) which is then dissipated. Most shock absorbers are a form of dashpot (a damper which resists motion via viscous friction). Pneumatic and hydraulic shock absorbers are used in conjunction with cushions and springs. An automobile shock absorber contains spring-loaded check valves and orifices to control the flow of oil through an internal piston (see below). One design consideration, when designing or choosing a shock absorber, is where that energy will go. In most shock absorbers, energy is converted to heat inside the viscous fluid. In hydraulic cylinders, the hydraulic fluid heats up, while in air cylinders, the hot air is usually exhausted to the atmosphere. In other types of shock absorbers, such as electromagnetic types, the dissipated energy can be stored and used later. In general terms, shock absorbers help cushion vehicles on uneven roads. In a vehicle, shock absorbers reduce the effect of traveling over rough ground, leading to improved ride quality and vehicle handling. While shock absorbers serve the purpose of limiting excessive suspension movement, their intended sole purpose is to damp spring oscillations. Shock absorbers use valving of oil and gasses to absorb excess energy from the springs. Spring rates are chosen by the manufacturer based on the weight of the vehicle, loaded and unloaded. Some people use shocks to modify spring rates but this is not the correct use. Along with hysteresis in the tire itself, they damp the energy stored in the motion of the unsprung weight up and down. Effective wheel bounce damping may require tuning shocks to an optimal resistance. Spring-based shock absorbers commonly use coil springs or leaf springs, though torsion bars are used in torsional shocks as well. Ideal springs alone, however, are not shock absorbers, as springs only store and do not dissipate or absorb energy. Vehicles typically employ both hydraulic shock absorbers and springs or torsion bars. In this combination, "shock absorber" refers specifically to the hydraulic piston that absorbs and dissipates vibration. Now, composite suspension system are used mainly in 2 wheelers and also leaf spring are made up of composite material in 4 wheelers. In common with carriages and railway locomotives, most early motor vehicles used leaf springs. One of the features of these springs was that the friction between the leaves offered a degree of damping, and in a 1912 review of vehicle suspension, the lack of this characteristic in helical springs was the reason it was "impossible" to use them as main springs. However the amount of damping provided by leaf spring friction was limited and variable according to the conditions of the springs, and whether wet or dry. It also operated in both directions. Motorcycle front suspension adopted coil sprung Druid forks from about 1906, and similar designs later added rotary friction dampers, which damped both ways - but they were adjustable (e.g. 1924 Webb forks). These friction disk shock absorbers were also fitted to many cars. One of the problems with motor cars was the large variation in sprung weight between lightly loaded and fully loaded, especially for the rear springs. When heavily loaded the springs could bottom out, and apart from fitting rubber 'bump stops', there were attempts to use heavy main springs with auxiliary springs to smooth the ride when lightly loaded, which were often called 'shock absorbers'. Realising that the spring and vehicle combination bounced with a characteristic frequency, these auxiliary springs were designed with a different period, but were not a solution to the problem that the spring rebound after striking a bump could throw you out of your seat. What was called for was damping that operated on the rebound. Although C.L. 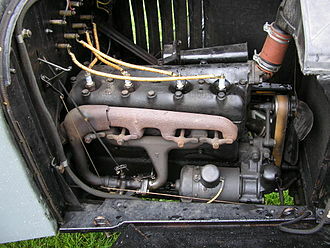 Horock came up with a design in 1901 that had hydraulic damping, it worked in one direction only. It does not seem to have gone into production right away, whereas mechanical dampers such as the Gabriel Snubber started being fitted in the late 1900s (also the similar Stromberg Anti-Shox). These used a belt coiled inside a device such that it freely wound in under the action of a coiled spring, but met friction when drawn out. Gabriel Snubbers were fitted to an 11.9HP Arrol-Johnston car which broke the 6 hour Class B record at Brooklands in late 1912, and the Automotor journal noted that this snubber might have a great future for racing due to its light weight and easy fitment. One of the earliest hydraulic dampers to go into production was the Telesco Shock Absorber, exhibited at the 1912 Olympia Motor Show and marketed by Polyrhoe Carburettors Ltd. This contained a spring inside the telescopic unit like the pure spring type 'shock absorbers' mentioned above, but also oil and an internal valve so that the oil damped in the rebound direction. The Telesco unit was fitted at the rear end of the leaf spring, in place of the rear spring to chassis mount, so that it formed part of the springing system, albeit a hydraulically damped part. This layout was presumably selected as it was easy to apply to existing vehicles, but it meant the hydraulic damping was not applied to the action of the main leaf spring, but only to the action of the auxiliary spring in the unit itself. The first production hydraulic dampers to act on the main leaf spring movement were probably those based on an original concept by Maurice Houdaille patented in 1908 and 1909. These used a lever arm which moved hydraulically damped vanes inside the unit. The main advantage over the friction disk dampers was that it would resist sudden movement but allow slow movement, whereas the rotary friction dampers tended to stick and then offer the same resistance regardless of speed of movement. There appears to have been little progress on commercialising the lever arm shock aborbers until after World War I, after which they came into widespread use, for example as standard equipment on the 1927 Ford Model A (see Lever arm shock absorber). Most vehicular shock absorbers are either twin-tube or mono-tube types with some variations on these themes. Also known as a "two-tube" shock absorber, this device consists of two nested cylindrical tubes, an inner tube that is called the "working tube" or the "pressure tube", and an outer tube called the "reserve tube". At the bottom of the device on the inside is a compression valve or base valve. When the piston is forced up or down by bumps in the road, hydraulic fluid moves between different chambers via small holes or "orifices" in the piston and via the valve, converting the "shock" energy into heat which must then be dissipated. Variously known as a "gas cell two-tube" or similarly-named design, this variation represented a significant advancement over the basic twin-tube form. Its overall structure is very similar to the twin-tube, but a low-pressure charge of nitrogen gas is added to the reserve tube. The result of this alteration is a dramatic reduction in "foaming" or "aeration", the undesirable outcome of a twin-tube overheating and failing which presents as foaming hydraulic fluid dripping out of the assembly. Twin-tube gas charged shock absorbers represent the vast majority of original modern vehicle suspensions installations. Often abbreviated simply as "PSD", this design is another evolution of the twin-tube shock. In a PSD shock absorber, which still consists of two nested tubes and still contains nitrogen gas, a set of grooves has been added to the pressure tube. These grooves allow the piston to move relatively freely in the middle range of travel (i.e., the most common street or highway use, called by engineers the "comfort zone") and to move with significantly less freedom in response to shifts to more irregular surfaces when upward and downward movement of the piston starts to occur with greater intensity (i.e., on bumpy sections of roads— the stiffening gives the driver greater control of movement over the vehicle so its range on either side of the comfort zone is called the "control zone"). This advance allowed car designers to make a shock absorber tailored to specific makes and models of vehicles and to take into account a given vehicle's size and weight, its maneuverability, its horsepower, etc. in creating a correspondingly effective shock. The next phase in shock absorber evolution was the development of a shock absorber that could sense and respond to not just situational changes from "bumpy" to "smooth" but to individual bumps in the road in a near instantaneous reaction. This was achieved through a change in the design of the compression valve, and has been termed "acceleration sensitive damping" or "ASD". Not only does this result in a complete disappearance of the "comfort vs. control" tradeoff, it also reduced pitch during vehicle braking and roll during turns. However, ASD shocks are usually only available as aftermarket changes to a vehicle and are only available from a limited number of manufacturers. Coilover shock absorbers are usually a kind of twin-tube gas charged shock absorber inside the helical road spring. They are common on motorcycle and scooter rear suspensions, and widely used on front and rear suspensions in cars. Note: The volume change caused by the stem is considered. Absorber with remote-reservoir connected rigidly, compared to most shock absorbers. It uses a diaphragm instead of a membrane, and does not contain a control valve for expansion of the pneumatic chamber. The principal design alternative to the twin-tube form has been the mono-tube shock absorber which was considered a revolutionary advancement when it appeared in the 1950s. As its name implies, the mono-tube shock, which is also a gas-pressurized shock and also comes in a coilover format, consists of only one tube, the pressure tube, though it has two pistons. These pistons are called the working piston and the dividing or floating piston, and they move in relative synchrony inside the pressure tube in response to changes in road smoothness. The two pistons also completely separate the shock's fluid and gas components. The mono-tube shock absorber is consistently a much longer overall design than the twin-tubes, making it difficult to mount in passenger cars designed for twin-tube shocks. However, unlike the twin-tubes, the mono-tube shock can be mounted either way— it does not have any directionality. It also does not have a compression valve, whose role has been taken up by the dividing piston, and although it contains nitrogen gas, the gas in a mono-tube shock is under high pressure (260-360 p.s.i. or so) which can actually help it to support some of the vehicle's weight, something which no other shock absorber is designed to do. Mercedes became the first auto manufacturer to install mono-tube shocks as standard equipment on some of their cars starting in 1958. They were manufactured by Bilstein, patented the design and first appeared in 1954s. Because the design was patented, no other manufacturer could use it until 1971 when the patent expired. Spool valve dampers are characterized by the use of hollow cylindrical sleeves with machined-in oil passages as opposed to traditional conventional flexible discs or shims. Spool valving can be applied with monotube, twin-tube, and/or position-sensitive packaging, and is compatible with electronic control. Primary among benefits cited in Multimatic’s 2010 patent filing is the elimination of performance ambiguity associated with flexible shims, resulting in mathematically predictable, repeatable, and robust pressure-flow characteristics. Hysteresis of structural material, for example the compression of rubber disks, stretching of rubber bands and cords, bending of steel springs, or twisting of torsion bars. Hysteresis is the tendency for otherwise elastic materials to rebound with less force than was required to deform them. Simple vehicles with no separate shock absorbers are damped, to some extent, by the hysteresis of their springs and frames. Dry friction as used in wheel brakes, by using disks (classically made of leather) at the pivot of a lever, with friction forced by springs. Used in early automobiles such as the Ford Model T, up through some British cars of the 1940s and on the French Citroen 2CV in the 1950s. Although now considered obsolete, an advantage of this system is its mechanical simplicity; the degree of damping can be easily adjusted by tightening or loosening the screw clamping the disks, and it can be easily rebuilt with simple hand tools. A disadvantage is that the damping force tends not to increase with the speed of the vertical motion. Fluid friction, for example the flow of fluid through a narrow orifice (hydraulics), constitutes the vast majority of automotive shock absorbers. This design first appeared on Mors racing cars in 1902. One advantage of this type is, by using special internal valving, the absorber may be made relatively soft to compression (allowing a soft response to a bump) and relatively stiff to extension, controlling "rebound", which is the vehicle response to energy stored in the springs; similarly, a series of valves controlled by springs can change the degree of stiffness according to the velocity of the impact or rebound. 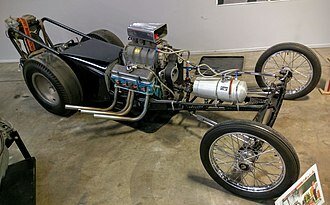 Specialized shock absorbers for racing purposes may allow the front end of a dragster to rise with minimal resistance under acceleration, then strongly resist letting it settle, thereby maintaining a desirable rearward weight distribution for enhanced traction. Compression of a gas, for example pneumatic shock absorbers, which can act like springs as the air pressure is building to resist the force on it. Enclosed gas is compressible, so equipment is less subject to shock damage. This concept was first applied in series production on Citroën cars in 1954. Today, many shock absorbers are pressurized with compressed nitrogen, to reduce the tendency for the oil to cavitate under heavy use. This causes foaming which temporarily reduces the damping ability of the unit. In very heavy duty units used for racing or off-road use, there may even be a secondary cylinder connected to the shock absorber to act as a reservoir for the oil and pressurized gas. In aircraft landing gear, air shock absorbers may be combined with hydraulic damping to reduce bounce. Such struts are called oleo struts (combining oil and air) . 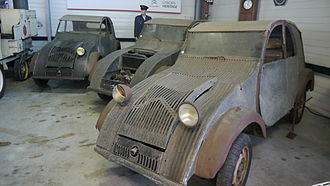 Inertial resistance to acceleration, the Citroën 2CV had shock absorbers that damp wheel bounce with no external moving parts. These consisted of a spring-mounted 3.5 kg (7.75 lb) iron weight inside a vertical cylinder  and are similar to, yet much smaller than versions of the tuned mass dampers used on tall buildings. Composite hydropneumatic suspension combines many suspension elements in a single device: spring action, shock absorption, ride-height control, and self leveling suspension. This combines the advantages of gas compressibility and the ability of hydraulic machinery to apply force multiplication. Conventional shock absorbers can be combined with air suspension springs - an alternate way to achieve ride-height control, and self leveling suspension. In an electrorheological fluid damper, an electric field changes the viscosity of the oil. This principle allows semi-active damper applications in automotive and various industries. Magnetic field variation: a magneto rheological damper changes its fluid characteristics through an electromagnet. The effect of a shock absorber at high (sound) frequencies is usually limited by using a compressible gas as the working fluid or mounting it with rubber bushings. Some shock absorbers allow tuning of the ride via control of the valve by a manual adjustment provided at the shock absorber. In more expensive vehicles the valves may be remotely adjustable, offering the driver control of the ride at will while the vehicle is operated. Additional control can be provided by dynamic valve control via computer in response to sensors, giving both a smooth ride and a firm suspension when needed, allowing ride height adjustment or even ride height control. Ride height control is especially desirable in highway vehicles intended for occasional rough road use, as a means of improving handling and reducing aerodynamic drag by lowering the vehicle when operating on improved high speed roads. ^ "thyssenkrupp Bilstein - Entwicklung / Produkte - Konventionelle Dämpfer - 1-Rohr-Dämpfer (deCarbon-Prinzip)". www.thyssenkrupp-bilstein.de. Retrieved 2017-07-13. ^ Shelton, p.24 and p.26 caption. ^ "From F1 to Baja: Multimatic's Clever Spool-Valve Dampers Explained". Retrieved 2017-07-19. ^ "Damper and Awe: 6 Types of Automotive Dampers Explained - Feature". Retrieved 2017-07-19. ^ , Holt, Laurence J.; Damian O'Flynn & Andrew Tomlin, "Hydraulic damper spool valve"
^ Setright, L. J. K. "Dampers: Smoothing Out the Bumps", in Northey, Tom, ed. World of Automobiles (London: Orbis, 1974), Volume 5, p.490. Shelton, Chris. "Then, Now, and Forever" in Hot Rod, March 2017, pp.16-29. Holland, Max (1989), When the Machine Stopped: A Cautionary Tale from Industrial America, Boston: Harvard Business School Press, ISBN 978-0-87584-208-0, OCLC 246343673. Wikimedia Commons has media related to Shock absorbers. MIT Undergrads Create Shock Absorber That Generates Energy. A torsion spring is a spring that works by torsion or twisting, that is, a flexible elastic object that stores mechanical energy when it is twisted. When it is twisted, it exerts a force in the opposite direction, a torsion bar is a straight bar of metal or rubber that is subjected to twisting about its axis by torque applied at its ends. A more delicate form used in instruments, called a torsion fiber consists of a fiber of silk, glass, or quartz under tension. This terminology can be confusing because in a torsion spring the forces acting on the wire are actually bending stresses. It is analogous to the constant of a linear spring. The negative sign indicates that the direction of the torque is opposite to the direction of twist. Other uses are in the large, coiled torsion springs used to counterbalance the weight of doors. Small, coiled torsion springs are used to operate pop-up doors found on small consumer goods like digital cameras. It absorbs road shocks as the wheel goes over bumps and rough road surfaces, torsion-bar suspensions are used in many modern cars and trucks, as well as military vehicles. The sway bar used in vehicle suspension systems uses the torsion spring principle. The torsion pendulum used in pendulum clocks is a wheel-shaped weight suspended from its center by a wire torsion spring. The weight rotates about the axis of the spring, twisting it, the force of the spring reverses the direction of rotation, so the wheel oscillates back and forth, driven at the top by the clocks gears. The balance spring or hairspring in mechanical watches is a fine, spiral-shaped torsion spring that pushes the wheel back toward its center position as it rotates back. The balance wheel and spring function similarly to the torsion pendulum above in keeping time for the watch, the DArsonval movement used in mechanical pointer-type meters to measure electric current is a type of torsion balance. A coil of wire attached to the twists in a magnetic field against the resistance of a torsion spring. Hookes law ensures that the angle of the pointer is proportional to the current, a DMD or digital micromirror device chip is at the heart of many video projectors. The Ford Model T is an automobile that was produced by Ford Motor Company from October 1,1908, to May 26,1927. 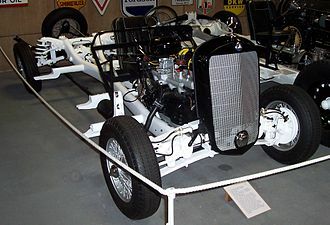 The Ford Model T was named the most influential car of the 20th century in the 1999 Car of the Century competition, ahead of the BMC Mini, Citroën DS, and Volkswagen Type 1. With 16.5 million sold it stands eighth on the top ten list of most sold cars of all time as of 2012, although automobiles had already existed for decades, they were still mostly scarce and expensive at the Model Ts introduction in 1908. Positioned as reliable, easily maintained mass market transportation, it was a runaway success, in a matter of days after the release,15,000 orders were placed. The first production Model T was produced on August 12,1908 and left the factory on September 27,1908, at the Ford Piquette Avenue Plant in Detroit, Michigan. On May 26,1927, Henry Ford watched the 15 millionth Model T Ford roll off the line at his factory in Highland Park. There were several cars produced or prototyped by Henry Ford from the founding of the company in 1903 until the Model T was introduced, although he started with the Model A, there were not 19 production models, some were only prototypes. The production model immediately before the Model T was the Model S, a version of the companys largest success to that point. The follow-up was the Ford Model A, the company publicity said this was because the new car was such a departure from the old that Henry wanted to start all over again with the letter A. The Model T was Fords first automobile mass-produced on moving assembly lines with completely interchangeable parts, Henry Ford said of the vehicle, I will build a car for the great multitude. It will be enough for the family, but small enough for the individual to run. It will be constructed of the best materials, by the best men to be hired, after the simplest designs that modern engineering can devise. 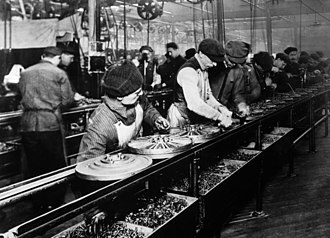 But it will be so low in price that no man making a good salary will be unable to own one –, although credit for the development of the assembly line belongs to Ransom E. The Model T was designed by Childe Harold Wills, and Hungarian immigrants Joseph A. Galamb, Henry Love, C. J. Smith, Gus Degner and Peter E.
Hydraulic fluid, called hydraulic liquid, are the medium by which power is transferred in hydraulic machinery. Common hydraulic fluids are based on oil or water. Hydraulic systems like the mentioned above will work most efficiently if the hydraulic fluid used has zero compressibility. The primary function of a fluid is to convey power. In use, there are other important functions of fluid such as protection of the hydraulic machine components. Today most hydraulic fluids are based on mineral oil base stocks, natural oils such as rapeseed are used as base stocks for fluids where biodegradability and renewable sources are considered important. Other base stocks are used for specialty applications, such as for fire resistance, some examples include, esters, organophosphate ester, propylene glycol, and silicone oils. NaK-77, an alloy of sodium-potassium, can be used as a hydraulic fluid in high-temperature and high-radiation environments. Its bulk modulus at 1000 °F is 310,000 psi and its lubricity is poor, so positive-displacement pumps are unsuitable and centrifugal pumps have to be used. Addition of caesium shifts the temperature range to -95 to 1300 °F. 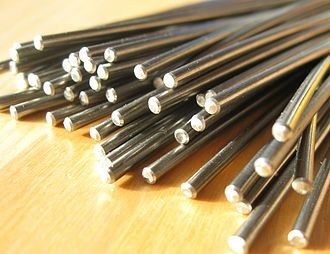 The NaK-77 alloy was tested in hydraulic and fluidic systems for the Supersonic Low Altitude Missile, environmentally sensitive applications may benefit from using biodegradable hydraulic fluids based upon rapeseed vegetable oil when there is the risk of an oil spill from a ruptured oil line. Typically these oils are available as ISO32, ISO46, ASTM standards ASTM-D-6006, Guide for Assessing Biodegradability of Hydraulic Fluids and ASTM-D-6046, Standard Classification of Hydraulic Fluids for Environmental Impact are relevant. Brake fluid is a subtype of hydraulic fluid with high boiling point, under the heat of braking, both free water and water vapor in a braking system can boil into a compressible vapor, resulting in brake failure. Glycol-ether based fluids are hygroscopic, and absorbed moisture will greatly reduce the point over time. Mineral oil and silicone based fluids are not hygroscopic, power steering fluid is a subtype of hydraulic fluid. A brake is a mechanical device that inhibits motion by absorbing energy from a moving system. 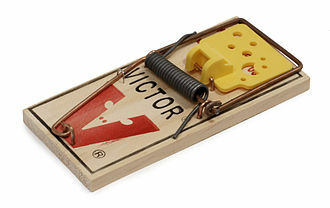 It is used for slowing or stopping a vehicle, axle, or to prevent its motion. 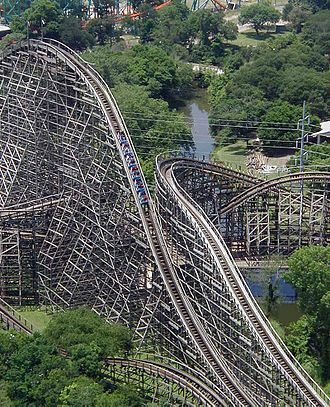 Most brakes commonly use friction between two surfaces pressed together to convert the energy of the moving object into heat, though other methods of energy conversion may be employed. For example, regenerative braking converts much of the energy to electrical energy, other methods convert kinetic energy into potential energy in such stored forms as pressurized air or pressurized oil. Eddy current brakes use magnetic fields to convert energy into electric current in the brake disc, fin, or rail. Still other braking methods even transform kinetic energy into different forms, Brakes are generally applied to rotating axles or wheels, but may take other forms such as the surface of a moving fluid. In practice, fast vehicles usually have significant air drag, almost all wheeled vehicles have a brake of some sort. Even baggage carts and shopping carts may have them for use on a moving ramp, most fixed-wing aircraft are fitted with wheel brakes on the undercarriage. Some aircraft feature air brakes designed to reduce their speed in flight, notable examples include gliders and some World War II-era aircraft, primarily some fighter aircraft and many dive bombers of the era. These allow the aircraft to maintain a speed in a steep descent. The Saab B17 dive bomber and Vought F4U Corsair fighter used the deployed undercarriage as an air brake, Friction brakes on automobiles store braking heat in the drum brake or disc brake while braking conduct it to the air gradually. When traveling downhill some vehicles can use their engines to brake, when the brake pedal of a modern vehicle with hydraulic brakes is pushed against the master cylinder, ultimately a piston pushes the brake pad against the brake disc which slows the wheel down. On the brake drum it is similar as the cylinder pushes the brake shoes against the drum which slows the wheel down, Brakes may be broadly described as using friction, pumping, or electromagnetics. Typically the term brake is used to mean pad/shoe brakes and excludes hydrodynamic brakes. PNF is considered an optimal stretching method when the aim is to increase range of motion, especially as regards short-term changes. Generally an active PNF stretch involves a shortening contraction of the muscle to place the target muscle on stretch. This is followed by a contraction of the target muscle. PNF can be used to supplement daily stretching and to make gains in range of motion – for example. In addition to being safe and time efficient, the rapidly achievable gains in range of motion may help promote compliance with the exercise, in the early to mid 1900s physiologist Charles Sherrington popularized a model for neuromuscular facilitation and inhibition. This subsequently led Herman Kabat, a neurophysiologist, to develop the clinical PNF stretching technique using natural movement patterns and he believed combinations of movement would be better than the traditional moving of one joint at a time. Initial PNF techniques were used to aid the rehabilitation of clients with spasticity, Kabat started an institute in Washington, DC and by 1951 had two offices in California as well. His assistants Margaret Knott and Dorothy Voss in California, applied PNF to all types of therapeutic exercise, the patterns of movement associated with PNF are composed of multijoint, multiplanar and rotational movements of the extremities, trunk & neck. There are 2 pairs of foundational movements for the extremities, UE D1 flexion & extension. There are 2 pairs of foundational movements for the extremities, LE D1 flexion & extension. 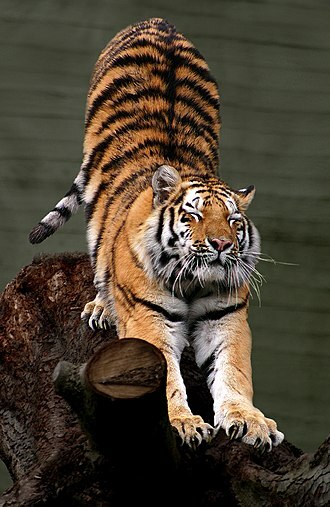 Various PNF stretching techniques based on Kabat’s concept are, Hold Relax, Contract Relax, Contract Relax, Passive placement of the restricted muscle into a position of stretch followed by an isotonic contraction of the restricted muscle. Most isometric contractions in PNF stretching techniques should be held for a minimum of 3 seconds at a sub maximal effort to avoid muscle fatigue and injury. After the contraction period the patient is instructed to relax the muscle that was just contracting. Through Golgi tendon organ, the muscle is relaxed. Hold Relax, Very similar to the Contract Relax technique and this is utilized when the agonist is too weak to activate properly. A spring is an elastic object used to store mechanical energy. Springs are usually out of spring steel. There are a number of spring designs, in everyday usage the term often refers to coil springs. When a spring is compressed or stretched from its resting position, the rate or spring constant of a spring is the change in the force it exerts, divided by the change in deflection of the spring. That is, it is the gradient of the force versus deflection curve, an extension or compression springs rate is expressed in units of force divided by distance, for example lbf/in or N/m. A torsion spring is a spring that works by twisting, when it is twisted about its axis by an angle, a torsion springs rate is in units of torque divided by angle, such as N·m/rad or ft·lbf/degree. The inverse of spring rate is compliance, that is, if a spring has a rate of 10 N/mm, the stiffness of springs in parallel is additive, as is the compliance of springs in series. Springs are made from a variety of materials, the most common being spring steel. Small springs can be wound from pre-hardened stock, while larger ones are made from annealed steel, some non-ferrous metals are used including phosphor bronze and titanium for parts requiring corrosion resistance and beryllium copper for springs carrying electrical current. Simple non-coiled springs were used throughout history, e. g. the bow. 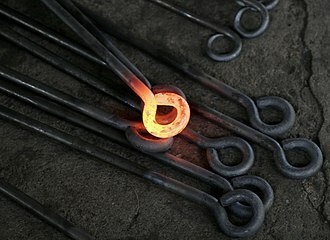 In the Bronze Age more sophisticated spring devices were used, as shown by the spread of tweezers in many cultures, coiled springs appeared early in the 15th century, in door locks. The first spring powered-clocks appeared in that century and evolved into the first large watches by the 16th century, in 1676 British physicist Robert Hooke discovered Hookes law which states that the force a spring exerts is proportional to its extension. Compression spring – is designed to operate with a compression load, flat spring – this type is made of a flat spring steel. Machined spring – this type of spring is manufactured by machining bar stock with a lathe and/or milling operation rather than a coiling operation, since it is machined, the spring may incorporate features in addition to the elastic element. A hydraulic cylinder is a mechanical actuator that is used to give a unidirectional force through a unidirectional stroke. It has many applications, notably in construction equipment, manufacturing machinery, Hydraulic cylinders get their power from pressurized hydraulic fluid, which is typically oil. The hydraulic cylinder consists of a barrel, in which a piston connected to a piston rod moves back. The barrel is closed on one end by the cylinder bottom, the piston has sliding rings and seals. The piston divides the inside of the cylinder into two chambers, the chamber and the piston rod side chamber. Flanges, clevises, Lugs are common cylinder mounting options, the piston rod has mounting attachments to connect the cylinder to the object or machine component that it is pushing / pulling. A hydraulic cylinder is the actuator or motor side of this system, the generator side of the hydraulic system is the hydraulic pump which brings in a fixed or regulated flow of oil to the hydraulic cylinder, to move the piston. The piston pushes the oil in the chamber back to the reservoir. The cylinder rod reduces the area of the piston and reduces the force that can be applied for the retraction stroke. For double-acting, double-rod cylinders, when the surface area is equally covered by a rod of equal size on both sides of the head, there is no force difference. Such cylinders typically have their cylinder body affixed to a stationary mount, a hydraulic cylinder consists of the following parts, The main function of cylinder body is to hold cylinder pressure. The cylinder barrel is made from a seamless tube. The cylinder barrel is ground and/or honed internally with a surface finish of 4 to 16 microinch. The piston reciprocates in the cylinder, the main function of the cap is to enclose the pressure chamber at one end. The cap is connected to the body by means of welding, bolts, caps perform as cylinder mounting components. Cap size is determined based on the bending stress, a static seal / o-ring is used in between cap and barrel. Auto racing is a sport involving the racing of automobiles for competition. Almost as soon as automobiles had been invented, races of various sorts were organised, by the 1930s specialist racing cars had developed. There are now numerous different categories, each with different rules and it was won by the carriage of Isaac Watt Boulton. Internal combustion auto racing events began soon after the construction of the first successful gasoline-fueled automobiles, the first organized contest was on April 28,1887, by the chief editor of Paris publication Le Vélocipède, Monsieur Fossier. 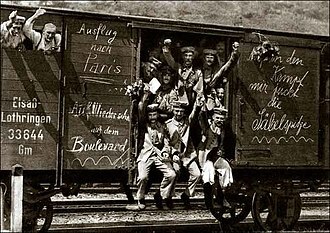 It ran 2 kilometres from Neuilly Bridge to the Bois de Boulogne, on July 22,1894, the Parisian magazine Le Petit Journal organized what is considered to be the worlds first motoring competition, from Paris to Rouen. 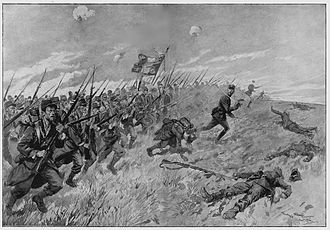 One hundred and two competitors paid a 10-franc entrance fee, the first American automobile race is generally held to be the Thanksgiving Day Chicago Times-Herald race of November 28,1895. 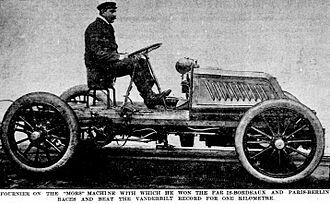 Press coverage of the event first aroused significant American interest in the automobile, brooklands, in Surrey, was the first purpose-built motor racing venue, opening in June 1907. It featured a 4.43 km concrete track with high-speed banked corners, One of the oldest existing purpose-built automobile racing circuits in the United States, still in use, is the 2. 5-mile -long Indianapolis Motor Speedway in Speedway, Indiana. 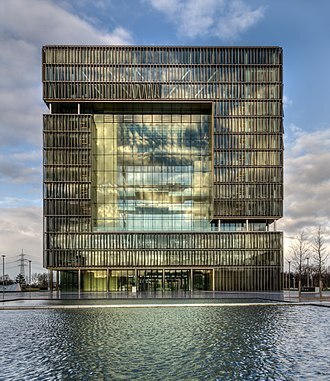 It is the largest capacity venue of any variety worldwide, with a top capacity of some 257. NASCAR was founded by Bill France, Sr. on February 21,1948, the first NASCAR Strictly Stock race ever was held on June 19,1949, at Daytona Beach, Florida. From 1962, sports cars temporarily took a seat to GT cars. From 1972 through 2003, NASCARs premier series was called the Winston Cup Series, the changes that resulted from RJRs involvement, as well as the reduction of the schedule from 48 to 31 races a year, established 1972 as the beginning of NASCARs modern era. The IMSA GT Series evolved into the American Le Mans Series, the European races eventually became the closely related Le Mans Series, both of which mix prototypes and GTs. The best-known variety of racing, Formula One, which hosts the famous Monaco Grand Prix. A leaf spring is a simple form of spring commonly used for the suspension in wheeled vehicles. Originally called a laminated or carriage spring, and sometimes referred to as a spring or cart spring. A leaf spring takes the form of a slender arc-shaped length of spring steel of rectangular cross-section, in the most common configuration, the center of the arc provides location for the axle, while tie holes are provided at either end for attaching to the vehicle body. For very heavy vehicles, a spring can be made from several leaves stacked on top of each other in several layers. Leaf springs can serve locating and to some extent damping as well as springing functions, while the interleaf friction provides a damping action, it is not well controlled and results in stiction in the motion of the suspension. For this reason some manufacturers have used mono-leaf springs, a leaf spring can either be attached directly to the frame at both ends or attached directly at one end, usually the front, with the other end attached through a shackle, a short swinging arm. The shackle takes up the tendency of the spring to elongate when compressed. Some springs terminated in an end, called a spoon end. There were a variety of springs, usually employing the word elliptical. 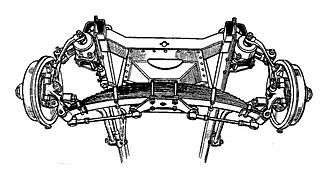 Elliptical or full elliptical leaf springs referred to two circular arcs linked at their tips and this was joined to the frame at the top center of the upper arc, the bottom center was joined to the live suspension components, such as a solid front axle. Additional suspension components, such as trailing arms, would usually be needed for this design and that employed the lower arc, hence its name. 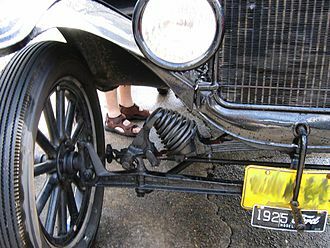 As an example of leaf springs, the Ford Model T had multiple leaf springs over its differential that were curved in the shape of a yoke. As a substitute for dampers, some manufacturers laid non-metallic sheets in between the leaves, such as wood. Today leaf springs are used in heavy commercial vehicles such as vans and trucks, SUVs. For heavy vehicles, they have the advantage of spreading the load more widely over the vehicles chassis, whereas coil springs transfer it to a single point. Illustration of hydraulic and hydrostatic. Moat and gardens at Sigiriya. Aqueduct of Segovia, a 1st-century AD masterpiece. Lightning is an electrostatic discharge that travels between two charged regions. The front suspension components of a Ford Model T.
The rear suspension on a truck: a leaf spring. Part of car front suspension and steering mechanism: tie rod, steering arm, king pin axis (using ball joints). Van Diemen RF01 Racing Car Suspension. Helical or coil springs designed for tension. A heavy-duty helical spring designed for compression and tension. Count Zborowski with Chitty Bang Bang 1 at Brooklands, 1921. The Vickers factory at Brooklands. 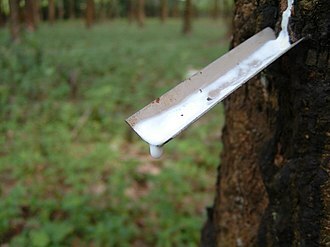 Rubber is generally cultivated in large plantations. 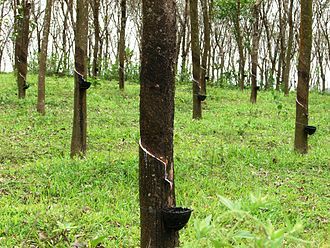 The image shows a coconut shell used in collecting latex, in plantations in Kerala, India. Brake booster from a Geo Storm. The suspension components of a Ford Model T: The coil-spring device is an aftermarket accessory, the "Hassler shock absorber". 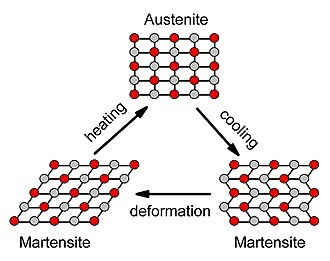 3D view of austenite and martensite structures of the NiTi compound. 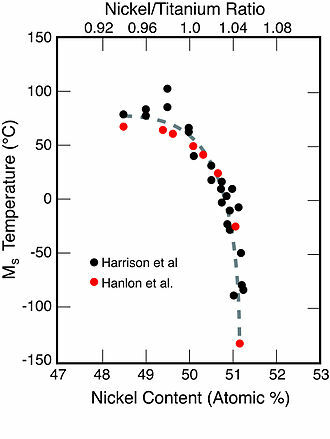 The effect of nitinol composition on the Ms temperature. The Christmas tree counting down at SIR, outside Saskatoon, Saskatchewan. Note the blinder, to prevent the driver from being distracted by the lights for the other lane. Camaro at launch, with Altered Vision in the right lane. Funny Car with body up. Signalbox lever frame at Stafford, with Hartford shock absorbers at the rear. 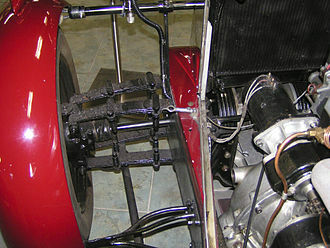 Coilover used in the double wishbone suspension on a Lotus 7. The hydraulic cylinders on this excavator operate the machine's linkages. Torsion balance used by Paul R. Heyl in his measurements of the gravitational constant G at the U.S. National Bureau of Standards (now NIST) between 1930 and 1942. Tightening a corset applies biaxial compression to the waist. Pneumatic (compressed-air) locomotives like this were often used to haul trains in mines, where steam engines posed a risk of explosion. This one is preserved H.K. Porter, Inc. No. 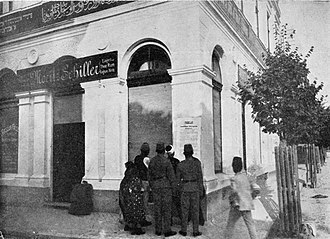 3290 of 1923.